1. HEAVY DUTY VINYL COATED S-HOOK: The two sturdy S-hooks made from metal that protects hull and prevents slipping, they are strong and dependable, never scratch your car or get rusty. 2. STRETCH ABRASION-RESIST ROPE: The Super tough braided nylon rope is high strength, low stretch and adjustable with any length according to your requirement. 3. PERFECT FOR KAYAK CANOE: Secures and tie down the bow and stern of your kayak/ canoe/ boat with this quick release pulley. 4. WIDE APPLICATION: Suitable for camping, hunting, moving, transporting toys or tools, and doing yard work. 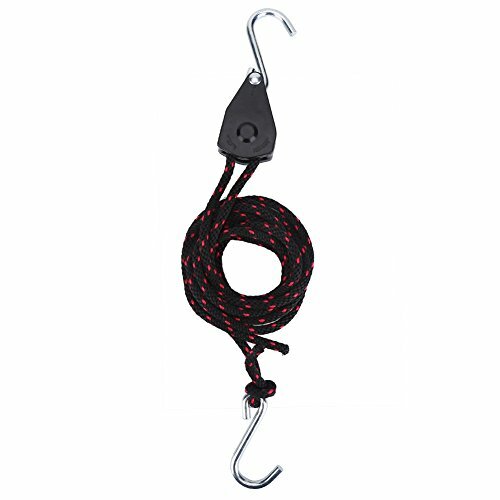 HEAVY DUTY VINYL COATED S-HOOK: The two sturdy S-hooks made from metal that protects hull and prevents slipping, they are strong and dependable, never scratch your car or get rusty. STRETCH ABRASION-RESIST ROPE: The Super tough braided nylon rope is high strength, low stretch and adjustable with any length according to your requirement. PERFECT FOR KAYAK CANOE: Secures and tie down the bow and stern of your kayak/ canoe/ boat with this quick release pulley. WIDE APPLICATION: Suitable for camping, hunting, moving, transporting toys or tools, and doing yard work.